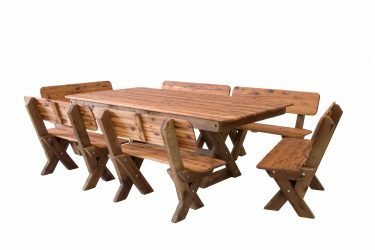 The large Yamba High Back Cypress Outdoor Timber Setting seats 12 guests and offers a comfortable eating and seating space in which to sit back and relax in your outdoor area. With a build in solid Cypress, the table L: 2200mm W:1200mm and six benches are a hard wearing garden furniture set suitable for outdoor dining throughout the year. 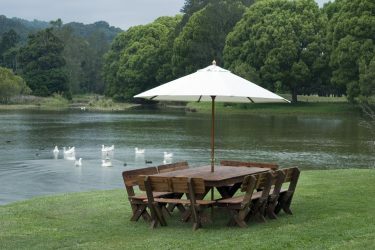 The tables cross leg configuration leaves loads of space for guests legs and the benches can be stowed away when not in use. In addition, if the table is not kept under cover, an umbrella hole can be included for a little extra cost. Besides that, the solid high back benches really do offer a comfortable seating area that subsequently allows guests to sit back and relax at an outdoor gathering. Because the benches are detached, you thereby have the advantage to use them for extra seating elsewhere in an outdoor living space. In other words, you can benefit by making more than one matching outdoor seating area in your home. Maybe even more reason to get out and enjoy the outdoors!